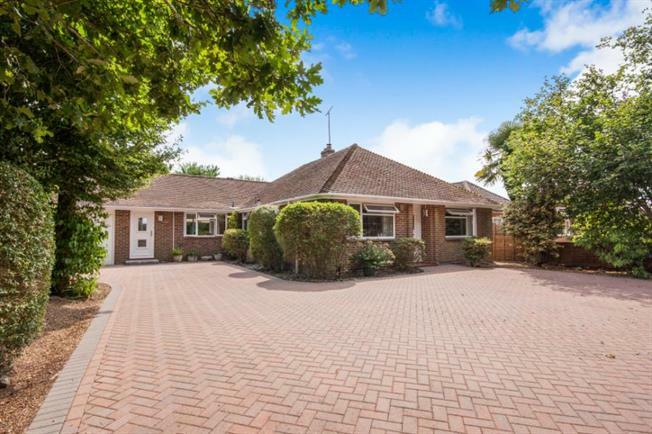 3 Bedroom Detached Bungalow For Sale in Crawley for Guide Price £550,000. Offered to the market for the first time in over 20 years, this rarely available superb detached bungalow sits within the highly desirable Pease Pottage, a great village offering convenient close onto the A23 and within easy distance to Crawley with its many amenities and thriving centre. The property has been with well looked after by the current owners yet offers buyers the scope to add their own taste and ideas. The bright and spacious accommodation has been an ideal family home and sits on one of the largest plots in the road. Accommodation comprises a welcoming entrance hall with both bedrooms to the front of the property. The master bedroom has been opened up to include the small third which now creates an attractive dressing area - a wall can be easily reinstated to provide a single third bedroom again. Towards the back of the property is the living room, with feature fireplace, a family room, dining room and deceptively spacious kitchen - all of which have been opened up to create an open plan living space across the rear and down the side of the bungalow. There is also a family bathroom and a separate WC. The property lends itself to a whole variety of options and variations with potential for extensions in the loft space also, subject to the relevant planning permissions. Externally, to the front, you will find a bricked driveway offering ample off road parking with access to the attached garage. The garage itself has been sectioned off into two, creating two great storage spaces accessed from both the front and the rear. The rear garden is a real wow factor! Such a great space for the whole family to enjoy! With a large decking area reaching across the whole of the property leading down to the vast lawn area. There is ample scope for any keen gardeners as well as plenty of room for entertaining and playing with the children. Viewings on this property are a must!